The polite thing to do would be to look the other way and simply pretend nothing out of the ordinary was going on. Fleetwood Mac is Fleetwood Mac, however, so a little soap-opera drama is to be expected along with the hits. And while the veteran transatlantic rock outfit did its best to make a show of how kicking Lindsey Buckingham out of the band earlier this year was no big deal, it only made it seem like a bigger deal. In a sense, missing a crucial member or two is nothing out of the ordinary for Fleetwood Mac. Of the original 1967 lineup, only drummer Mick Fleetwood and bassist John McVie remain, after all, and both Stevie Nicks and Christine McVie (along with Buckingham himself) have left the group and returned to the fold at odd points over the past 40 years or so. Nevertheless, Monday’s show at Toronto’s sold-out Scotiabank Arena found the band being almost stridently blasé about the fact that, for reasons that remain rather fuzzy — not to mention the subject of a lawsuit since filed by Buckingham — it had recently fired the songwriter and the voice behind some of its most recognizable tunes. Buckingham has kind of had the last laugh, anyway, since it’s taken two musicians to replace him: former Crowded House/Split Enz singer Neil Finn on the vocal front and Mike Campbell, the late Tom Petty’s longtime right-hand man in the Heartbreakers, in the guitar-god department. But just to make sure we all knew that it was business as usual in Fleetwood Mac, the band opened with “The Chain,” one of Buckingham’s signature songs from Rumours. And, to some extent, it was business as usual. Finn could certainly hold down the vocal parts, as he would do two songs later on “Second Hand News” and at the very end of the two-and-a-half-hour set on the crowd-pleasing whoppers “Go Your Own Way” and “Don’t Stop,” while Campbell dropped a scorching mini-solo on the outro to allay any fears that we’d be denied six-string fireworks. Finn feels a bit more like a karaoke singer, although the band did let him take the reins for Crowded House’s “Don’t Dream It’s Over” just to demonstrate that he had a life before he was imitating Lindsey Buckingham for a living. Green, of course, was no doubt invoked to make a point about a lot of people passing through the ranks of Fleetwood Mac over the years, just as former guitarist Danny Kirwan — who died this past June — was invoked by way of introduction on his “Tell Me All the Things You Do,” another pre-Buckingham/Nicks gem that found its way into the set list. Truth be told, refreshing the ranks certainly didn’t hurt Monday’s performance. 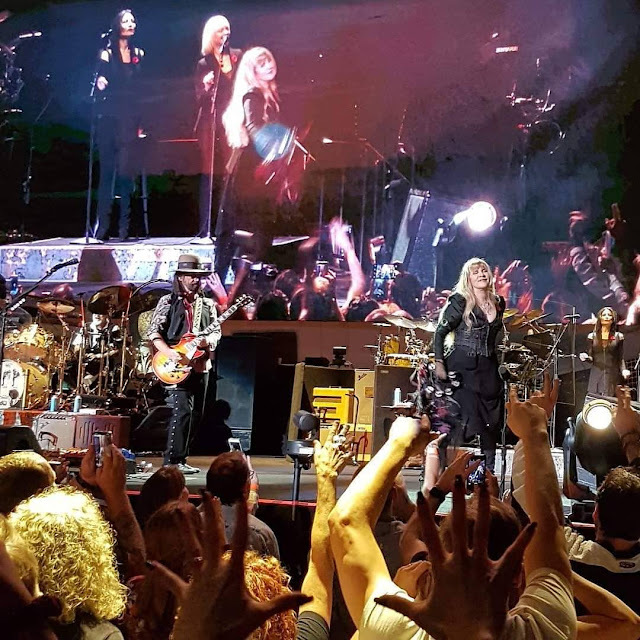 Fleetwood Mac is a reliably solid live entity, no matter who’s onstage, and the band does indeed appear to be relishing the new energy at the moment. You could only miss Buckingham so much, even if you wanted to miss him. It’s arguably all about Stevie Nicks, anyway. When Fleetwood went around the stage to introduce each of his bandmates — this would be after his torturously long drum solo in the middle of “World Turning,” by the way — only the perpetually humble and quiet John McVie came close in terms of audience reaction. The screams for Stevie were deafening. And, man, can she still hold it down. Christine McVie sounded a little wan when she took the mike for “Little Lies” and “Everywhere,” but Nicks’s voice was huge and still in impossibly good shape on “Rhiannon,” a feminized version of Green’s “Black Magic Woman,” her solo hit “Gypsy” and a bare, beautiful late-set reading of “Landslide.” She prowled the stage like a panther conjuring some major voodoo vibes, too, during a truly menacing attack on “Gold Dust Woman” — anchored, fittingly enough, by fellow fan favourite John McVie’s rumbling bass line — that easily won out as the most show-stopping moment of the night and probably should have ended the set. No one, of course, was getting out of there without hearing “Go Your Own Way” and “Don’t Stop,” but they seemed a little anticlimactic after such a beast of a tune — especially when the guy behind them wasn’t actually onstage. But by that point, it had become rather easy to overlook Buckingham’s absence and simply enjoy what was a very good arena-rock show. And, hey, Stevie came back to pay tribute to her old pal Tom Petty with Campbell on an unnecessary, but nice enough cover of “Free Fallin’.” If Stevie’s in the room, all can be forgiven.